How do I change which class a student is in? From the Control Panel, select Manage Accounts. Once you're in the Manage Accounts section you'll be able to see your classes. Each of your classes will have their own tile at the top of the page and the rest of the classes in your school are listed at the bottom of the page. Click on the class to which you'd like to add a student. Once you've clicked on a class, you can select + Add Student on the right-hand side of the page. Enter the details in the dialogue box that appears. Once you start typing in the student's name, the system will suggest students that are already enrolled in the school. If you find the student in the Other Suggested matches, simply click Add to Class. You can add a new student by selecting Add a new Student from the left-hand side of the screen. If the student does not have an account yet, select Create a new student account. Fill in the details as required. The Help button will indicate if your school requires Student IDs or email addresses to ensure we can match student accounts year on year. Once this is complete, select the Add to a class in the bottom right corner of the page. Students who are added to a class will automatically be assigned any tasks or assessments that are currently assigned to that particular class. Select the checkbox next to the student's name. Select Remove from this class, and confirm the selection. The student will then be removed from this class, and will no longer be assigned any tasks and homework for this class. If a student is removed from all their classes, their account will become inactive, and they will be unable to log in. 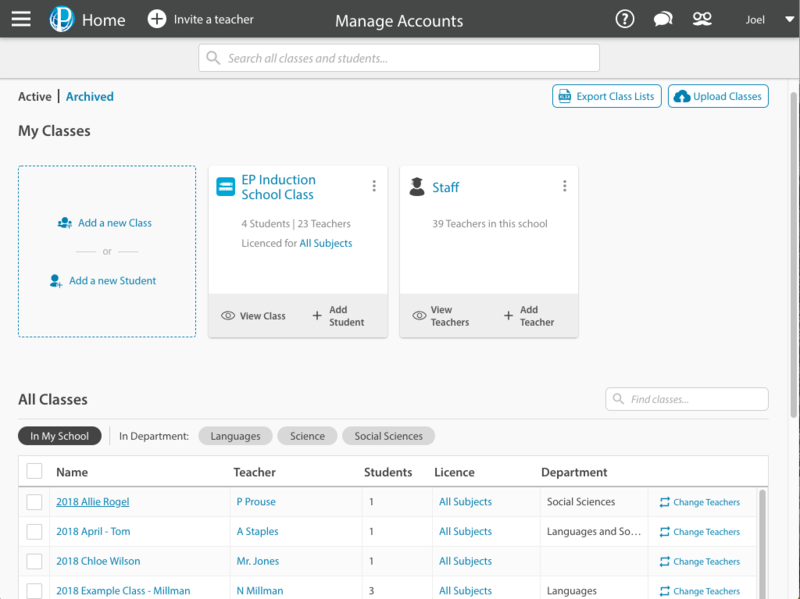 You can also create a new teacher account and add the teacher to your class. If a teacher is leaving your school, please get in touch with us through support@educationperfect.com. We'd be happy to deactivate the teacher's account or transfer them to their new school.